During the fall we will introduce speakers, startups and investors who will board the Slush Flight from Silicon Valley to Helsinki. Let’s meet the first startup: GoGoGuest. Cafés, also called the “Third Place” between work and home, are probably one of the most popular scenes for unexpected events. A café Chai Bar, in San Francisco, was also the place where Jessica Valenzuela, Co-Founder of GoGoGuest, and Alex, Slush CMO, met. “I walked into a café where most of the tables were occupied by ‘digital nomads’ or the generation of people who work anywhere. Alex happened to be in my favorite spot. A table that could fit at least 3 to 4 people, so I casually strolled up to him, said my hellos and asked if we could share the table. Within a few minutes, we were talking tech, startups, and coffee,” Valenzuela explains. The random talk between a San Francisco-based startup founder and a Helsinki-based tech conference organizer sparked new ideas of working together and bridging the entrepreneur community in San Francisco and Helsinki. Now, Valenzuela and the GoGoGuest team are boarding the Slush Flight in November and flying to Helsinki – for the first time. GoGoGuest is a startup that is helping cafés and small business food and beverage merchants tap into the 55 Million digital nomad and work anywhere life stylists. Their solution allows coffee bars to gauge their store’s performance, offer transaction-driven premium WiFi, and real-time campaigns and analytics. For coffee shop goers, GoGoGuest has an app that enables users to find coffee shops with reliable WiFi. The story of GoGoGuest started in Europe, as well. None other than in a café. “While at a café in New York my Co-Founder, Chris O’Connor, and I marveled at how the coffee shop was a great place for a ‘mobile office,’” says Valenzuela. They thought that if coffee shops asked customers to pay an hourly fee in order to use a fast and secure WiFi, they would do so. During a couple of months, this duo explored the idea deeply by talking to local coffee shop owners, trying to understand their daily transaction patterns. “We discovered that when coffee shops included WiFi as part of the Third Place experience, 80% more people frequented the establishment but there was no significant increase in transactions. People were coming in, but weren’t buying anything else beyond their first cup of coffee or a muffin, even if they stayed on average for 4 to 8 hours a day”, explains Valenzuela. GoGoGuest wants to help coffee shop owners deepen the Third Place experience while helping them capture 30% more in transactions daily. The company was established in January 2016 and is in full swing to grow. 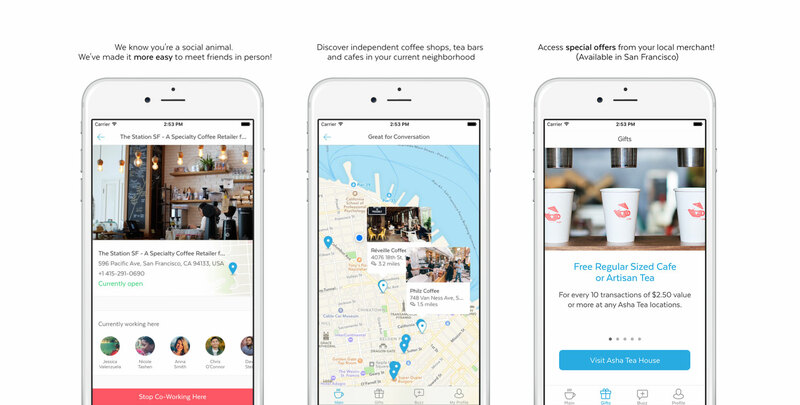 They’ve released the first version of an iOS consumer-facing mobile app and are installing the MVP of the full solution in 5 coffee shops in San Francisco.The team aims to raise $375K in Pre-Seed in the Fall of 2016 to release the full production version of the guest services solution and grow their customer base. “I can’t wait to visit Helsinki during Slush 2016. We no longer come to Europe solely for the museums, croissants, food, wine and excellent outdoor adventures. We also come for the vibrant startup ecosystems,” concludes Valenzuela. In case the flight might interest you, feel free to contact our captain at [email protected]!